No fewer than ten Democratic senators are running for reelection in states that Donald Trump carried in 2016 — some by large margins. Amid partisan polarization and the growing trend toward straight-ticket voting, it seems impossible that all (or even most) of these anomalies could survive in 2018. But there are two mitigating factors we sometimes forget: (1) presidential elections are comparative, while midterms tend to be (usually sour) referenda on the party that controls the White House, which means you cannot assume the partisan balance in any given state will remain the same, and (2) it’s not 2016 anymore, and Trump’s popularity can’t be assumed to have remained static all this time in every state. You can see the difference a more dynamic view of the “Trump Ten” senators makes in the latest quarterly state-by-state numbers showing Senate approval and disapproval ratings from Morning Consult. They did something interesting: They directly compared the average net approval ratings for senators from April through June with those of the president over the same period of time in the same states. Turns out eight of the Trump Ten are doing better than Trump himself in their states. Perhaps the most interesting numbers are from North Dakota, which Trump carried by 33 points against Hillary Clinton in 2016. In the second quarter of 2018, however, Trump’s net approval rating in North Dakota was minus-10 points. 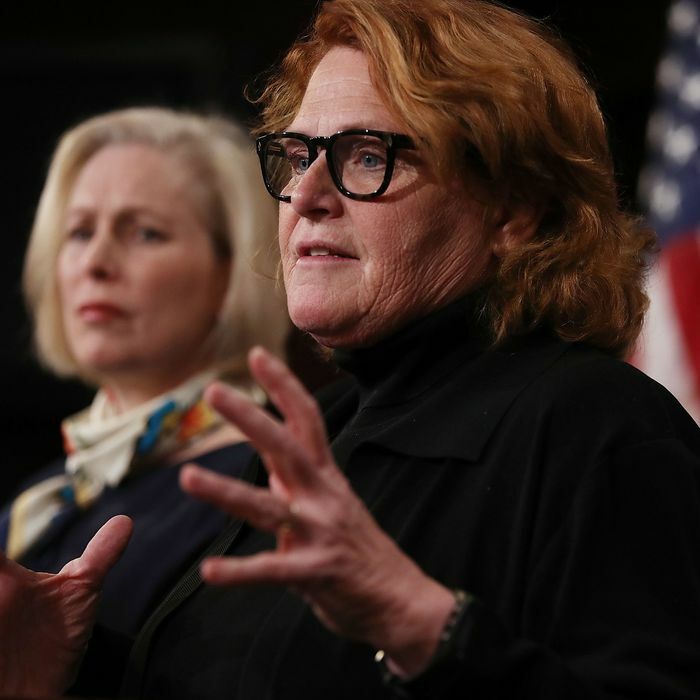 Now as it happens, Heitkamp isn’t in great shape; her own net approval rating is zero, and she faces a formidable GOP opponent in U.S. Representative Kevin Cramer. But it looks like Cramer, not Trump, is her problem, which gives her some freedom to be more critical of the president than she might otherwise be in a state he had carried so overwhelmingly. Another good example is Wisconsin’s Tammy Baldwin. Yes, Trump narrowly carried her state in 2016. But in Q2 2018 his average approval rating there was minus-16 points. By comparison Baldwin’s net approval rating over that period was plus-5, which is immensely better. Similarly, Trump carried Ohio in 2016 by eight points, which was impressive given the state’s recent voting history. But his Q2 2018 average approval rating in the Buckeye State was minus-6, while Senator Sherrod Brown’s is plus-16. No wonder Brown is presently a solid favorite for reelection. The two Trump Ten Democratic senators who do trail Trump in Q2 2018 approval ratio averages are Joe Manchin and Claire McCaskill. West Virginia was Trump’s second-best state in 2016 (after Wyoming); he won it by an astonishing 42 points. He’s still pretty popular there, with a plus-23 net approval rating in the second quarter of this year, as compared to Senator Joe Manchin’s plus-3. Manchin’s divided GOP opposition and his long familiarity with the state are helping him keep a lead in the polls. Missouri’s Claire McCaskill’s tepid minus-4 approval ratio trails Trump’s (plus-2), but not as much as you’d normally expect in a state he carried by 21 points. Meanwhile, Trump’s net approval rating in Montana, which he carried by 20 points, has sunk to plus-3, while Senator Jon Tester’s looking pretty good at plus-14. The gap between presidential and senatorial net approval is smaller in Indiana (Trump is at plus-5, Joe Donnelly at plus-8). Florida’s Bill Nelson is at plus-10 (Trump is at plus-2 in Florida), but his problem is not so much Trump as his opponent Rick Scott, who has endless money and a net gubernatorial approval rating (again, in the second quarter of this year) of plus-19. None of this means Democrats will win control of the Senate; aside from the fact that several of the Democratic senators we’ve been talking about aren’t out of the woods just yet, Democrats need to find a way to beat at least one and preferably more than one Republican incumbent (or win an open seat like those in Arizona and Tennessee). But it’s important to remember that whatever his standing compared to where he was in 2017 or earlier this year, Trump remains generally weaker than he was when facing an equally unpopular Democratic opponent in a year when Democrats weren’t remotely as energized as they are right now.